With the new year here, the luxury Nikki Beach Resort & Spa Dubai will become a top destination in 2017. 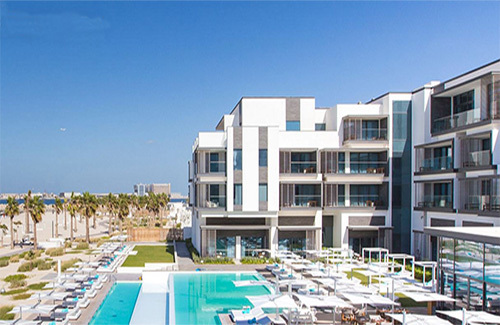 Just opened last month, the new luxury resort in Dubai was launched by Nikki Beach Hotels & Resorts Ltd.
Nikki Beach Resort & Spa Dubai becomes the fourth property in Nikki’s popular global portfolio of stylish beach and urban retreats. The opening follows the launch of Nikki Beach Dubai Restaurant & Beach Club in early 2016. This luxurious resort and spa in the United Arab Emirates offers endless luxury amenities for their guests to enjoy. Found on Pearl Jumeira and adjacent to a gorgeous 450-meter long sandy beach, Nikki Beach Resort & Spa Dubai features 132 keys in addition to 63 private residences. With so many land and water activities available, this spacious property is definitely a luxury lifestyle resort. In total, the property is 52,000-square-meters in size. Therefore guests can easily get some privacy and alone time. Enjoy the awe inspiring views of nearby Dubai skyline, plus the Arabian Gulf. Guestrooms are equipped with individual climate control, wireless internet and also come with your own private balcony. In addition, enjoy mood lighting, a high-end entertainment systems, complimentary high-speed WiFi, plus a personalized minibar. The room decor follows a beachside-chic aesthetic. Rooms and suites are decorated feature the bright whites, pale blues and natural wood elements that is Nikki Beach’s signature look. There is plenty of natural light in these spacious accommodations. For those guests who stay in one of the beachside villas, you will have direct access to the beach, plus the property’s four private pools, sun-warmed terraces and private cabanas. What a VIP experience! For those who want to get in a little exercise at Nikki Beach Resort & Spa Dubai, try the tennis court and and relaxing Nikki Spa and Tone Gym. Take advantage of the gym’s high-end Technogym fitness equipment. Foodies will feel like they have gone to cuisine heaven. Feast at five different restaurant and lounges. Your dining choices include – Nikki Beach Dubai Restaurant & Beach Club, with globally-inspired fare in a beachside setting; Café Nikki, an all-day urban bistro; Soul Lounge, offering creative bites to complement chilled-out tunes and uplifting beverages, plus Nikki Privé, an exclusive lounge with perfect views of the sunset. Lastly, Key West is a blending of Floridian, Caribbean and Latin cuisine. This upscale restaurant will open later this year and promise to deliver a distinctive, fine dining experience. Be sure to make plans to visit Dubai, United Arab Emirates and enjoy a luxury stay at Nikki Beach Resort & Spa Dubai. The Life of Luxury assist you with all your travel plans. Stop by again to read our luxury blog for more luxury travel ideas.